Not even a superhero could have saved Powerless. Tonight, Deadline has confirmed NBC has cancelled the TV series, after only one season. Part of the DC Comics universe, the comedy follows Emily Locke (Vanessa Hudgens), the new Director of Research & Development for Wayne Security, a subsidiary of Wayne Enterprises that specializes in products that make defenseless bystanders feel a little safer. The cast also includes Alan Tudyk, Danny Pudi, Ron Funches, and Christina Kirk. 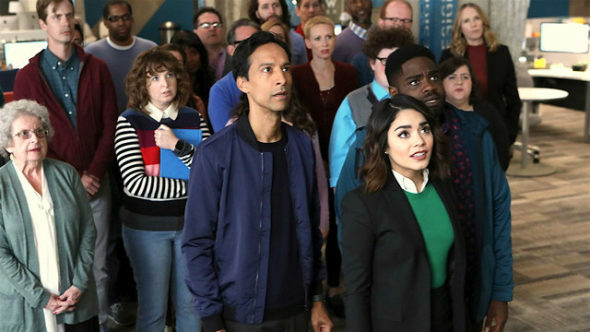 Things haven’t been looking good for Powerless since the show debuted in February to dismal ratings. So far, only nine episodes of the comedy have aired, earning an average rating of .71 in the 18-49 demo and only 2.29 million viewers. This makes Powerless the lowest-rated and least-watched NBC series for the 2016-2017 season. In April, NBC pulled the series from its Thursday night schedule, effectively cancelling it. It’s unclear when or if the network will air any of the show’s remaining episodes. What do you think? Did you see Powerless? Do you think NBC should’ve given the show a second chance? A clever silly comedy. Not like the rest of horrible network TV. I knew they would cancel it for some dumb reality retred. “2broke girls” its more stupid than this show and have one of the highest rating. Whats was wrong with “powerless”? 2broke Girls has giant breasts on display constantly. There’s your answer~! Too bad they pull the trigger on shows so fast. To be honest I never heard about it until this week and then binged watched the full season. Hulu would be smart to pick this show up and make a season two. I really think people are missing out on a great show. Has anyone checked to see how it’s doing on Hulu? If people actually watched things like they did before technology became amazing this show would do great. It’s like galavant all over again. Are there any petitions happening for a transfer to the CW? It was a funny show and better than a lot of current stuff out there. It’s too bad – This was an interesting idea for a show. Maybe the superhero-theme pipeline is nearing capacity? Too bad the new WB-DC streaming channel apparently has no interest in continuing the production of this series. It would be a draw for me. What a great idea for a show, I really enjoyed it and so did all of my family and my friends that we told about it. NBC should have given it more time. Many people don’t have cable anymore and wait for TV shows to show up on Netflicks to watch them. I think this one would have done really well with more time. I liked Powerless. It had a great cast and was funny. I would like to see the remaining episodes.